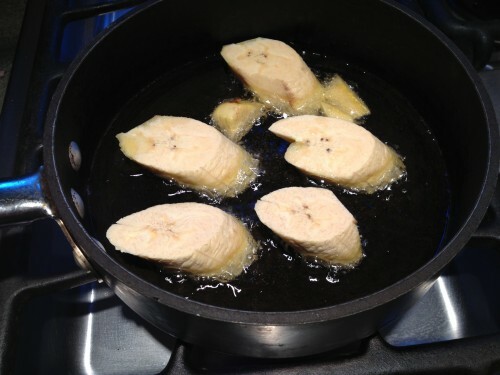 The first time I had plantains, I was in Haiti just after the earthquake and the ability to cook tasty food was very limited. We had plantains, but they were bland, being mostly boiled or something like that. The next time I was in Haiti, the accommodations were much nicer and the cook had better supplies and equipment. This time we had plantains, but they were called “tostones”. They were wonderful! On subsequent trips to the Carribean, I have enjoyed plantains as “tostones” and “mufongo”. When I came home this time, I was determined to figure out how to make these! So, I did a little research and found it is quite simple. First, I select the plantain like I do bananas. Don’t be afraid to start with green ones. 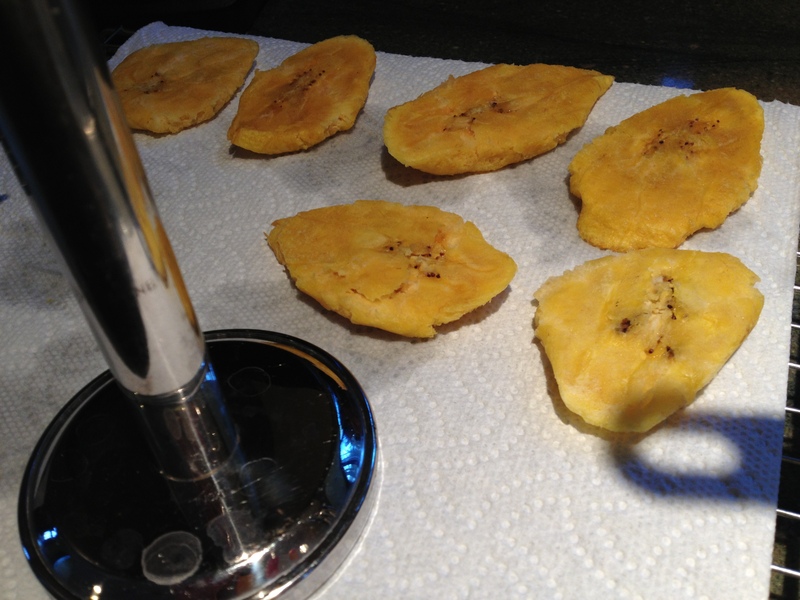 If you want the tostones to be sweeter, just let the plantain ripen on your counter. They are easier to peel if they are yellowish. The small pieces are my way of testing the oil. If they start sizzling, then I add the large pieces. I think if the oil is hot, the food doesn’t absorb as much of the oil. So, after you fry them once, you flatten the pieces and fry them again! This seems excessive, but it really is what makes the best tostone. You can try baking them the second time, but trust me, they will not be as good. So go ahead – splurge! Try some tasty Caribbean food! 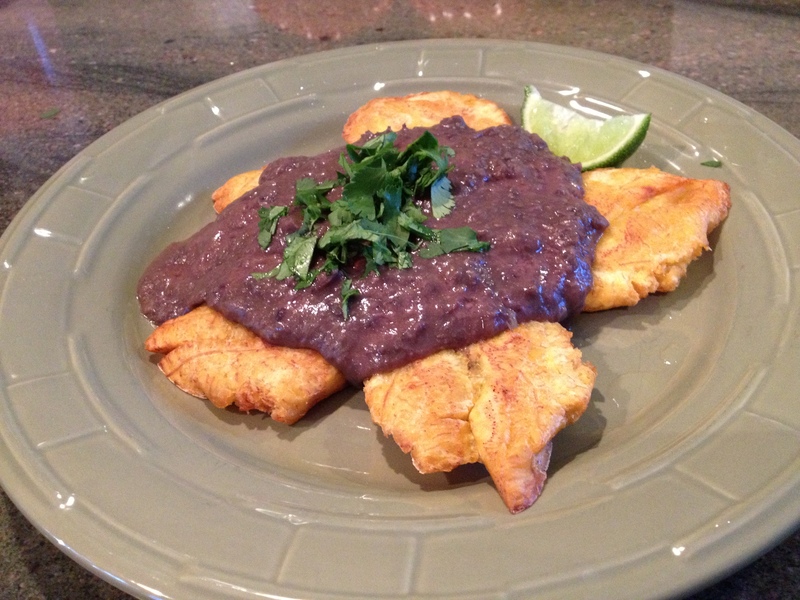 The Black Bean Sauce is just Simple Black Bean Soup, reduced! Be sure to have some hot sauce on hand. It will add a wonderful kick! What would you use to flatten if you don’t have one of those fancy press things? You could use the bottom of a glass. You just need a flat surface, so a spoon probably wouldn’t work very well.